The Cab Sav 2013 has notes of red cherries and the hint of a herbal character blended with savoury elements from time spent in oak. The wine is soft but well structured. The flavours are of red cherries and yellow plums with a subtle earthy character behind. This is an easy drinking wine. Enjoy with all your favourite dishes. 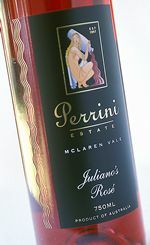 This is a blend of fruit sourced from Mclaren Vale and Perrini vineyards. It is a blend of Malbec, Petit Verdot and Shirz and has been matured in oak for fifteen months. This wine has powerful, rich aromas of red berries, currants and spice. Round, smooth and medium bodied, it has an abundance of ripe, sweet fruit. McLaren Vale in South Australia is renowned for its cool maritime climate and has established an excellent reputation for producing world class shiraz. The 2013 vintage has produced a concentrated wine with structure and good fruit intensity so typical of this region. This wine was fermented in open fermenters where the skins are worked with the juice to extract the primary flavours and colour. It is then transferred to be gently basket pressed and left for maturation with American oak. The palate is full with sweet fruit flavours of ripe mulberries and spicy blackberries, which combine with fine tannins to provide good depth of flavour and length. The colour has brilliant shades of crimson and reds, vibrant purple and pink hues. The palate is soft, lively, fresh and full of berry flavours with a clean acid finish. Excellent as an aperitif or perfect with Asian or Mediterranean cuisine. The ideal “Veranda” wine. Best served well chilled. 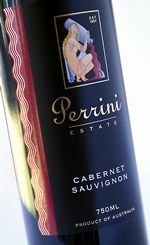 The 2001 Perrini Estate Shiraz was made from fruit sourced from McLaren Vale, famous for its full bodied, big Shiraz fruit due to its warm climate. A lifted, spicy nose shows gentle oak and rich, berry fruit with hints of spice and pepper. On the palate it has generous mouth filling ripe fruit flavours, balanced by American oak. 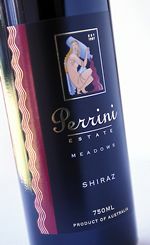 This is a complex, well balanced Shiraz and is a perfect example of a true Australian, full bodied red wine. Will improve with further cellaring. Freight charges are not included in wine prices.